This is our custom-built Mogami 2319 3.5mm -1/8" TS for PiezoBarrel (or similar) to a selection of connections for wired and wireless systems. This is a custom cable designed to connect to the PiezoBarrel pickup www.piezobarrel.com with a 3.5mm TS plug to a wide selection of connectors compatible with wireless systems like Shure TA4F, Line6 TA4F, Sennheiser 3.5mm locking and more or a selection of TS 1/4" connectors for amps and Direct boxes. 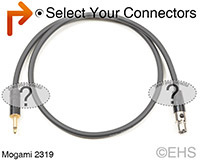 Construction is all top quality connectors like Neutrik, Rean, Switchcraft, and Amphenol with Mogami 2319 cable. These connectors are some of the best connectors around. Mogami 2319 cable is very flexible, durable, light-weight cable. This is for PiezoBarrel pickup and other similar devices. May fit other pickups and wireless systems with these connectors, contact us for more info. TS Black Gold straight 1/8"
Photo 2 shows one option for the cable.